Comments: “Treehouse of Solitude” Lincoln just want a little peace and quiet. With a house full of sisters that is not all that likely. He does have a plan and carries it out. A few moments of silence is all he wanted. The art is cute showing off all the Loud siblings. “Hai-Poo” This is a cute short story with cute art. Lily seems to be having fun in it. “Starving” Sometimes things just when they seem brightest turn out not to be. Poor Lincoln. “Cooking with the Casagrandes” Be careful about bragging it will get you into trouble. Nice fire breathing here. “Code Crisis” Lincoln and Clyde are best friends. Here we see them having some fun together as friends do. “Disjoint Custody” All the Loud siblings want a family pocket watch. So it is all out war to see who gets it. The solution is a unique one. Their relatives are as out of this world as they are. “The Loud Journey” Here we see the Loud siblings and friends using their imagination. They do have one imaginative adventure. “Worked Up” Roberto here is being overused at home and it is getting to be way too much. His family though is understanding. The art is cartoon style and looks amazing. “Maybe It’s Natural” When trying to impress a girl do it the right way, not the embarrassing way. “Swishful Thinking” The girls’ basketball team sure know how to play. They are drawn cute on the court. “Situation Souffle” Mr. Loud has fun in the kitchen. He is illustrated with some wonderfully expressive expressions. “Tough Hooky” Abuela has some weird solutions to problems. Abuela is a wonderful character. “Sore Players” Dad and daughter get into some serious competition. They do still have fun playing. The art is done in a cute style. “Citizen Loud” Things do not always go as planned especially in the Loud home. We see best friends having fun though. The Loud family is such a cute family. “Baby Break” Aw poor doggy has fun and then no fun with the baby. This baby is smart. “Leave A Penny, Take A Penny” Do not mess with a Loud kid. “Dressed Out” Mom does look good in her dress. She is also drawn with a lovely smile. “Lucy’s ABC’s of the Loud House” All is well that ends well as this issue ends peacefully. 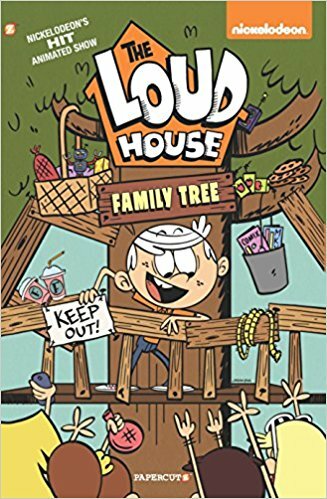 The Loud family is an all ages comic for all to enjoy. Based on the hit TV series you are sure to enjoy this.